I've seen the movie "Airplane!" so many times and I always chuckle at my favorite scene. It's when the flight attendant offers a thin leaflet titled "Jewish Sports Legends" to a passenger on the plane. The stereotype that Jews aren't successful in sports might be fairly accurate. After all, there really aren't that many famous Jewish athletes. However, what's even more rare than a famous Jewish athlete is a famous Jewish NASCAR driver. That makes the story of Alon Day really unique. Not only is NASCAR driver Alon Day Jewish, but he's also Israeli. 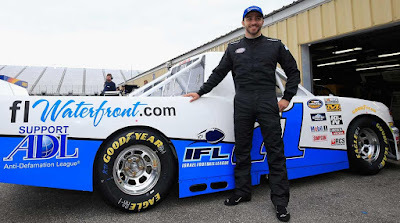 A recent article in Sports Illustrated noted that Alon Day is the first Jewish NASCAR driver. He led his team to their first-ever first place finish. While Day didn't drive the team's car in the victory lap, he managed to hold a spot in one of the top ten positions and for a while even maintained second place. Alon Day is from Ashdod, the country's sixth-largest city and the largest port in all of Israel. Day's benefactor is Jewish attorney David Levin, who has a goal of promoting Israel through motorsports. Yes, that is an odd goal, but he might be on to something. NASCAR hasn't traditionally had a large Jewish fan base, although it is growing. I've been a fan of NASCAR my entire life because of the excitement of the speeding cars and the drivers fighting for position around the track. Perhaps I discovered my love of auto racing as a kid in Detroit watching the Detroit Grand Prix race around the streets of downtown Detroit and Belle Isle. Levin is also a lifelong NASCAR fan who evidently believes strongly in Alon Day. After NASCAR identified Day as one of the emerging talents in the sport, Levin began raising money for the driver. He took out $60,000 from retirement savings in order to sponsor Day for two races recently. Other donors gave to a GoFundMe campaign raising money to sponsor Day for future NASCAR races. Levin has appealed to Warren Buffet and El Al Airlines, who both politely declined sponsorship. He's still waiting for a response from Adam Sandler. Levin is currently soliciting donations including a million dollar sponsorship offer. Day is proud to be Jewish and Israeli. The stickers on his racecar are logos from the Jewish Federation, Israeli Football League and the Anti-Defamation League. Apparently those aren't sponsorships, just free stickers those organizations have given to the driver. However, the article in Sports Illustrated reports that "the ADL has expressed some interest in contributing more seriously in 2017." As to the culture of NASCAR and whether this Israeli driver fits in with the motorsports zeitgeist, that remains to be seen. One thing is for sure, NASCAR is getting some exposure to this Israeli. 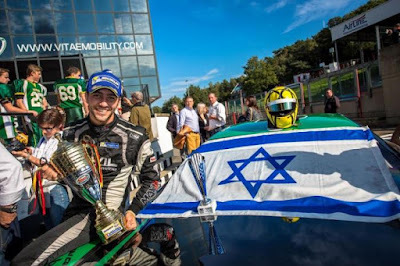 Alon Day is a great ambassador for Israel. "I think also it’s a good thing because I always talk about myself as a guy who came from Israel, a completely different place," he told SI. "I came from the desert, from a country that you always hear about on CNN and war and everything. But I always make fun about it. I’ve always said about myself that I put a bit more spicy sauce on the meal." 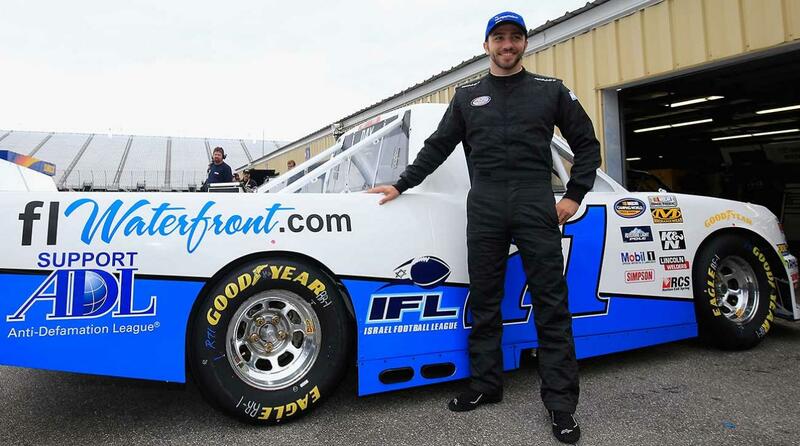 I, for one, am very excited about the promising NASCAR career of Alon Day. Never in my life did I imagine an Israeli Jewish NASCAR driver, but hey, why not?